My name is Lynette Zilio, and I specialize in digital communications, specifically social media and SEO. 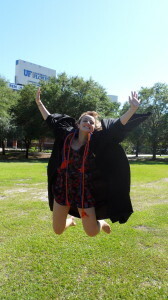 I graduated with a bachelor’s degree in journalism and a minor in Spanish from the University of Florida (UF) in 2011 and am currently enrolled in UF’s online Master of Arts in Mass Communication with a specialization in Social Media program. During my undergraduate career, I was exposed to print, online and multimedia journalism as well as to public relations through my coursework, extracurricular activities and internship opportunities. (I was fortunate enough to be selected for summer internships with both the Miami Herald and The Denver Post). After graduation, I interned with a public relations agency and then went on to work in the sales and consumer relations departments of a wholesale handbag company. Currently, I run all of the SEO and social media campaigns for Miami cloud-computing company 0NL9, Inc. I began my master’s program in January 2014 to learn more about the business side of social media. So far, I have been able to apply much of what I’ve learned in school to my assignments at work as well as bring my professional experience to the virtual classroom. I am a team player, a quick learner and am eager to continue to learning and growing as much as I can in the field of digital communications.